The textural stitch pattern is “front and center” in our Pediwick Scarf. 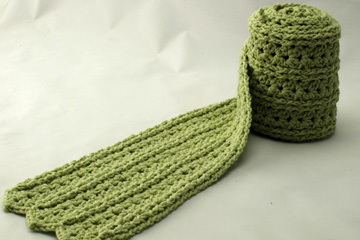 Made with just one skein of Pediwick yarn, the stitch pattern is easy to memorize. Worked in narrow rows from the center to each end, the scarf is perfectly symmetrical with matching ends! Note: Photographed model made with Knit One Crochet Too Pediwick in #537 Sage.